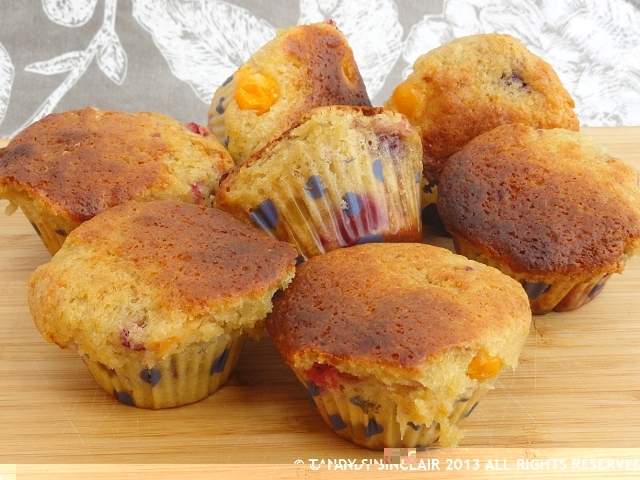 These orange berry muffins are the perfect snack for before you go to gym. Or after training. Or even just because you feel like it. This month for The Secret Recipe Club, I was assigned Christine’s Kitchen Chronicles. Christine’s real life job is as an engineer and she comes from a family of cooks. Even though she only started cooking at college, you can find a lot of diverse recipes on her blog. Christine’s dog Toby looks like it would be right at home in my kitchen as well! Christine still has Africa on her list of places to visit so I hope she will appreciate having a South African on her list of visitors to her blog. In choosing my recipe I clicked on the American tag as this is one type of cuisine I don’t do much of. I chose the chicken and roasted root vegetable pot pie after much searching through all her recipes. I used up some of my leftover pastry as my freezer needs a good clean out. I also adapted the recipe to suit our palates and our diet. It was only when I went onto my own blog to see how long to cook the pastry for that I saw I had already posted a recipe for chicken pot pie, and it was a SRC reveal recipe as well. Please pop in to see this recipe as I can really recommend it. The gravy is truly awesome. I used chicken stock as my poaching liquid and my choice of vegetables were butternut, carrots and fennel bulb. If I do this again I am going to blind bake the bottom layer of pastry first to make it extra crunchy. So, with half a day left of leave I knew I had the time to make a second recipe. I decided to make muffins as this is something we can eat at work for a lunch time treat. As we both train quite extensively we need something to get us through the gym sessions. I chose the orange berry muffins as I did not think it would be a problem getting buttermilk, and I had one orange in the fridge that needed to be used up, as well as some frozen berries which I purchased for a photo prop. Sadly, our local store did not have buttermilk but I decided to make them using yoghurt and see how they turned out. They were super moist and stayed fresh the entire week. This will be a must have recipe to work with for me and I will make variations during the year to keep us well fed before gym. Do you eat before exercising? Hola Tandy, first happy 2013, your new page looks beautiful, congratulations…..I love muffins, looks delicious, have a good week, saludos from Spain! Yum – lots of lovely zingy flavours! Tandy, the muffins sound delicious – we often sub milk + yoghurt for buttermilk – and your pies look absolutely amazing! I love the combination or orange and berries! I’ve not made muffins in quite awhile; looks like thhis will be a great recipe to try! please do try and let me know what you think! That photo looks amazing Tandy. My kids love pot pies. Your muffins sound delicious. Welcome home…I know you enjoyed time with your family. I am pinning this to my must try recipes. 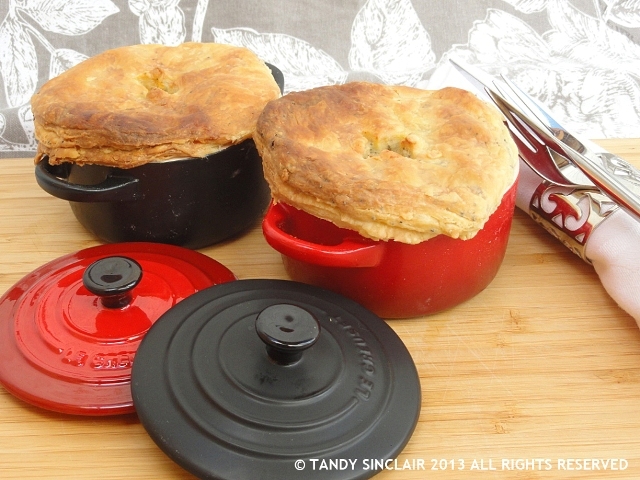 Tandy, your chicken pot pie looks fabulous…and the orange berry muffins sounds delicious. Orange zest adds a special “something” to so many recipes. Great SRC recipe choice to share. I absolutely LOVE these! Delish and making soon. Glad to be part of SRC with you! thanks for the visit Lisa, and do let me know what you think of them! Hi Tandy! I definitely feel honored knowing a South African has graced my blog :). If I ever get the chance to go, I’ll have to get tips from you! I’m so glad that you enjoyed not 1 but 2 of the recipes on my blog. These are both wonderful picks and I’m realizing now that I really have quite the eclectic collection of recipes on my blog which your picks demonstrate haha! The muffin recipe sounds good, the potpie picures looks amazing! These muffins sound really good! Those individualized pot pies look amazing & that pastry is looking fabuliscious too! What a great photo of the chicken pot pies! Ooh, orange and berry muffins sound fabulous. What great flavors! This muffins would make a great pre or post workout treat. I usually just have a banana. Those muffins sound delicious. Got to try them out. I love those muffins!! Yummy!